For What Will You Stand? Home 2017 October 17 For What Will You Stand? One of the most quoted lines Francis Scott Key wrote. He probably did not think his poem “Defence of Fort M’Henry” would become a part of today’s National Anthem which is such an attribute in today’s society, centuries later. Though, I do not typically participate in political disputes or politics for my own reasons, I do, like everyone else, have an opinion on this specific matter. As of late, there have been some athletes who are taking a knee during the National Anthem. They feel as though they are taking a stand against the unfair treatment happening to African Americans and other minorities projected from police and other government officials within the United States. Those that are against taking a knee during the National Anthem will say it is disrespectful to the men and women fighting for our country. Football player, Colin Kaepernick, began a protest in his own way by not standing for the National Anthem. In turn, many people tried to state that he was going against America. He was displaying his own form of nationalism. His message was to show he disagrees with the current state affairs in America. Kaepernick stated, “I am not going to stand up to show pride in a flag for a country that oppresses black people and people of color.” This was his way of trying to publicly announce that discrimination of any kind to anyone is inappropriate. There are many possible ways for this protest to be resolved, yet the government is making all the wrong moves to solve this problem. If it were not for a stubborn president and other government officials, this protest could be stopped easily without adding more fuel to the fire. But nothing is that easy when it comes to the government and its laws. Trump tried to punish the athletes for not standing and that caused more of an outrage. I feel as though Colin Kaepernick has every right to take a stand against the National Anthem at a time like this. 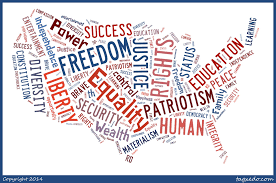 “…O’re the land of the free and the home of the brave” is meant for everyone to be treated as equals and to have a fair opportunity within the United States. He is a public figure who has the voice to speak for the “Little Guy” who is mistreated as an American. Since the game, there has been much slander as well as the termination of his contract. I do not agree with this at all. It is an act of unjust. Which again goes against the National Anthem. For What Will You Stand? by Thomas is licensed under a Creative Commons Attribution-ShareAlike 4.0 International License. I agree that we have to choose what we will stand for and what we won’t. If people are doing us injustice, especially because of our skin color, we have to speak up about it. The black lives matter movement does not receive all the support that it needs so we must use our knowledge to amplify our voices and use our teamwork to make them that much stronger. To me equality is something that really matters because I feel like at one point in my life I would of wanted justice for someone. You’re absolutely right Thomas. He has the right to say what he feels, even the right to kneel during our National Anthem. I would defend his right to do that any day of the week. The question however whether the act of kneeling itself is right to do is quite another matter. The U.S. has a Constitution, the government and ,it’s leaders, work with the Constitution to make the best nation possible (or not such as if there’s a high of police brutality. However, the National Anthem is meant to reflect the bravery of our soldiers who fought for our freedom during the Revolutionary War, not the government. So in other words, if you’re protesting against the National Anthem, you’re protesting against the values of our country, not how the government rules the country. This is absolutely stupid to me, there has got to be a better way to protest than this. But I do agree the athlete got screwed over. Here’s an interesting history of the Anthem if you want to read it: https://www.shmoop.com/the-star-spangled-banner/meaning.html Thank you for bringing this up. I think this is a very interesting subject matter. At my school, there have been many debates on “is it okay, or is it not?” I think that it is the football player’s right, to take a knee during the national anthem, but I know I would never take a knee during the national anthem. I too agree that the government is not handling this situation way. I mean our President is tweeting about it, which I think is very inappropriate. I enjoyed reading your thoughts on this issue.